For a little over ten dollars per person, you and your friends could be celebrating your party here with us at Stafford Skate Centre! Forget organising things; we'll do it for you! Please note that blade hire is not included in the above plan. Blades can be hired for just $4.00/person. Simply obtain your ticket for blades from the snack bar when you arrive for your party! 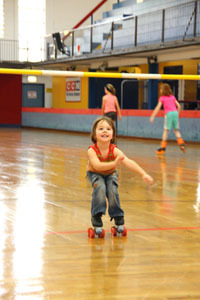 For any more information about birthday parties at Stafford Skate Centre or for party bookings, just call (07) 3357 4444. Bookings fill up very quickly so remember: book your party early! Download your party flyer and invitation below!